The Suvarov | LosLocos !! 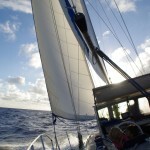 The ship has just finished a three year voyage from Europe via the Caribbean and the south Pacific to Australia. She was sold on 2nd of April 2015. 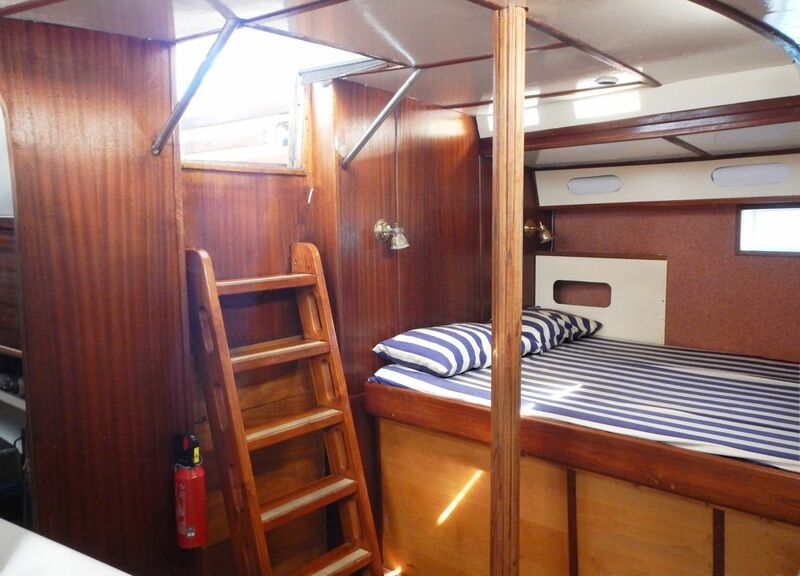 Front cabin: Double berth; length on starboard side: 2m, on port side 1,5m. 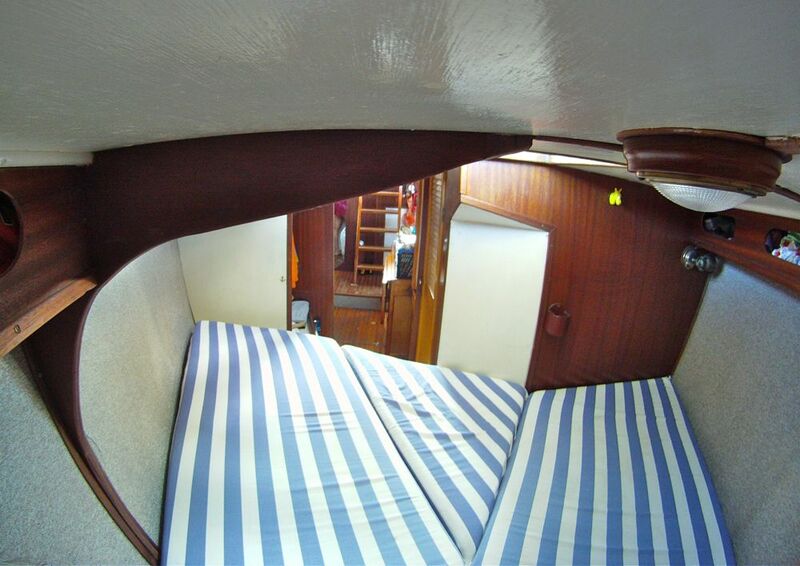 Huge storage underneath both berths, cove lockers on both sides over the whole length of the cabin, small locker on the starboard side towards the saloon. 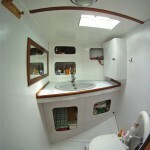 Big hatch (0,55m x 0,55m) opening forward and smaller window (0,2m x 0,33m) on the starboard side, aft. 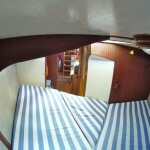 Head: located port side, between front cabin and saloon. Washbasin and Jabsco toilet (with complete service kit), lot of storage underneath and behind the washing stand. Small window (0,2m x 0,33m). 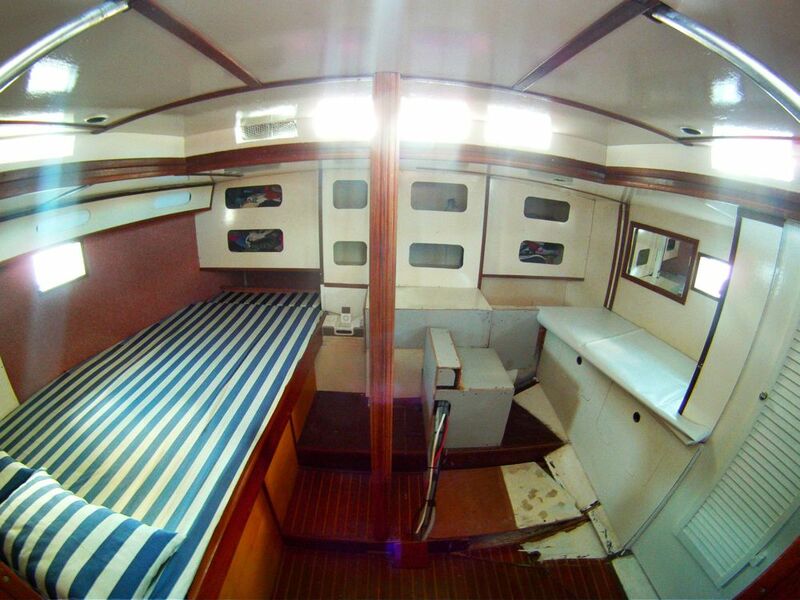 Saloon: Very roomy and wide saloon with huge central table to be opened on both sides. 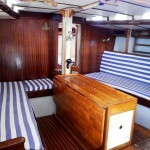 L-shaped saloon bench on port side, length: 1,85m. 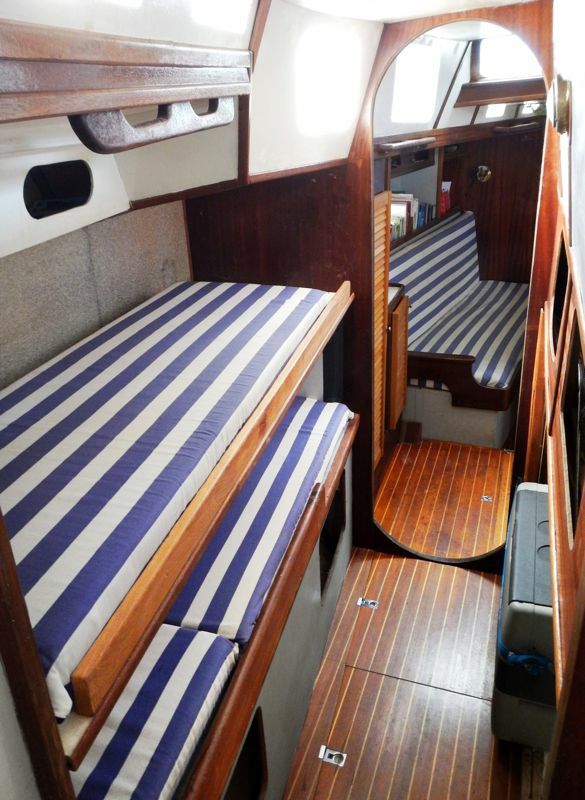 On starboard side another berth with 1,9m length. 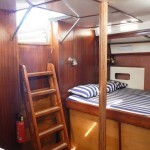 Both are to be used as berths when at sea as both have lee clothes installed. Underneath both benches and behind the backrest there is loads of stowage place. There are cove lockers on both sides and additional spaces to put books, CDs, etc. 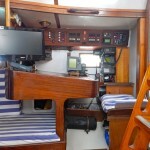 Chart table: Located in between starboard saloon bench and galley there is the top-opening chart table (0,95m x 0,75m), including a seat and a window to the side. Passageway towards the aft cabin: port side of the cockpit one can walk to the aft cabin. 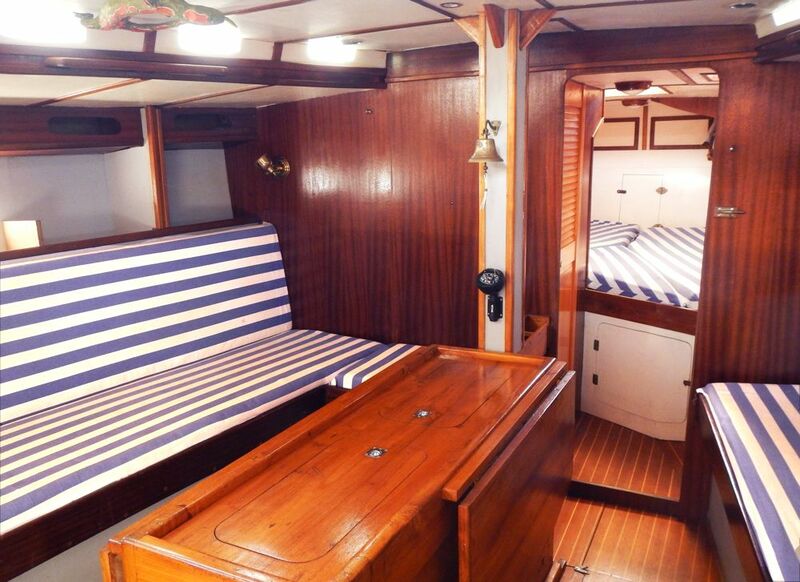 Here there are two quarter berths on the starboard side with lots of stowage underneath for tools, etc. 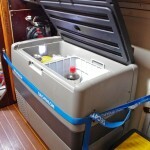 On the port side the Waeco fridge is to be found as are the solar power controller, the inverter and the battery charger. 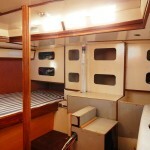 Aft cabin: Enormous aft cabin with extra long double berth (1,30m x 2,25m) on the starboard side. 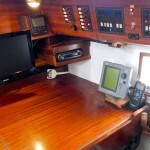 writing desk on port side. 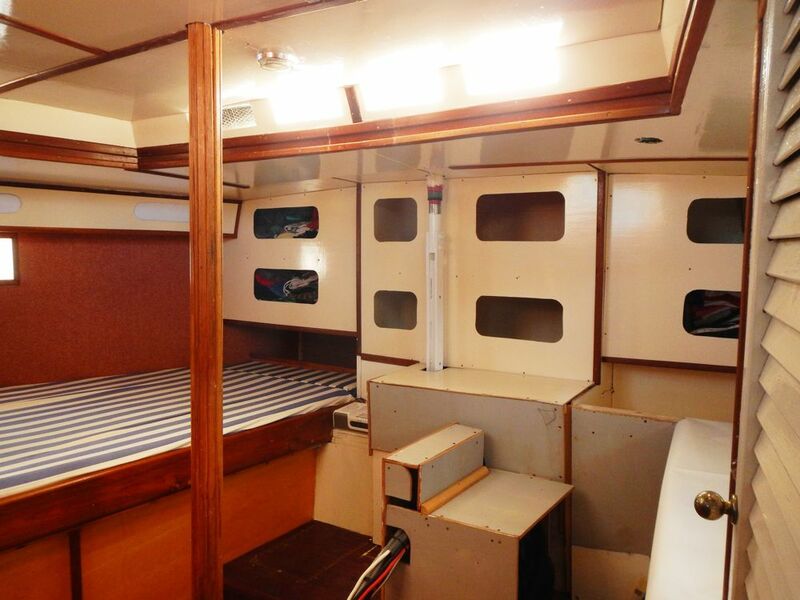 Two windows in the sides, eight slit-windows in the superstructure and the huge hatch make this room very bright and friendly. 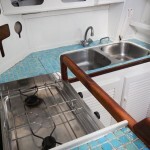 Two Vetus and two dorade vents provide additional air. 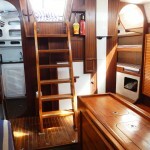 Stowage: The whole wall on the aft side is used as locker, in front of the desk there is another locker with hangers. Underneath the bed approx. 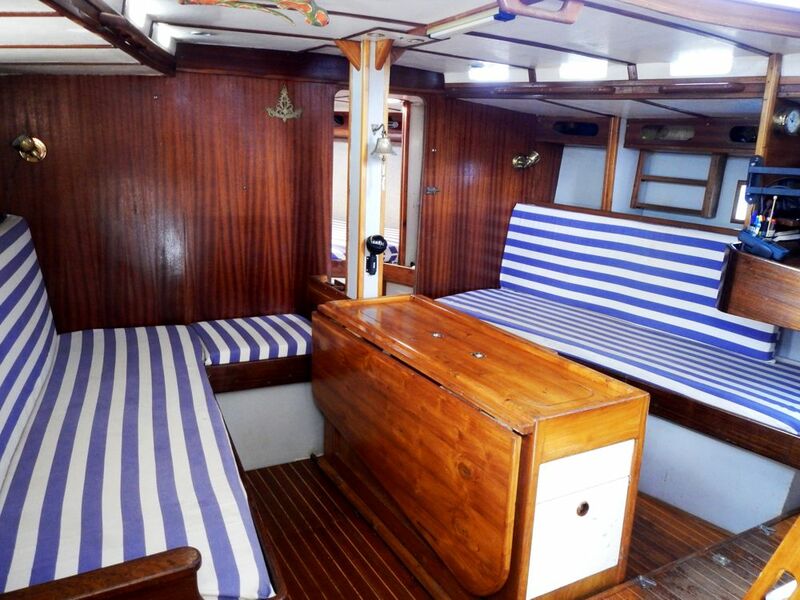 two cubic meters of place for tools, sails, etc. Underneath and beside the desk is more storage room. The cover of the steering, the floorboards and the little seat are still under construction and will be finished in the next weeks. 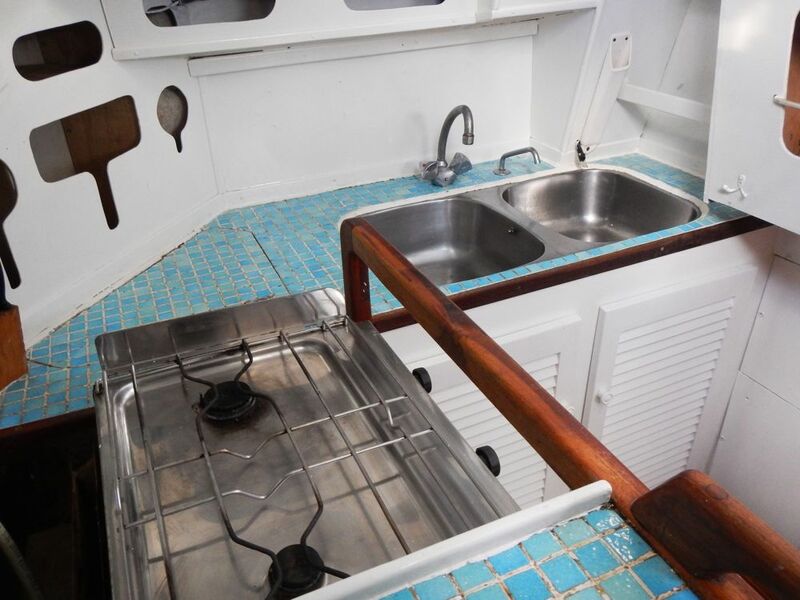 Bilges: The bilges in Saloon, galley, passageway and in the aft cabin are all clean and dry and provide additional room to store whatever you want. 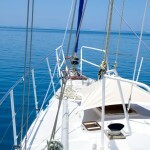 The whole deck is fenced in by a solid, 0,80m high guardrail made from 22mm stainless steel. 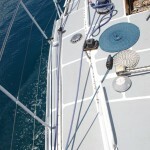 Two additional 5mm lifelines to be found 0,25 and 0,50m above deck and a 5cm toe rail running nearly around the ship. 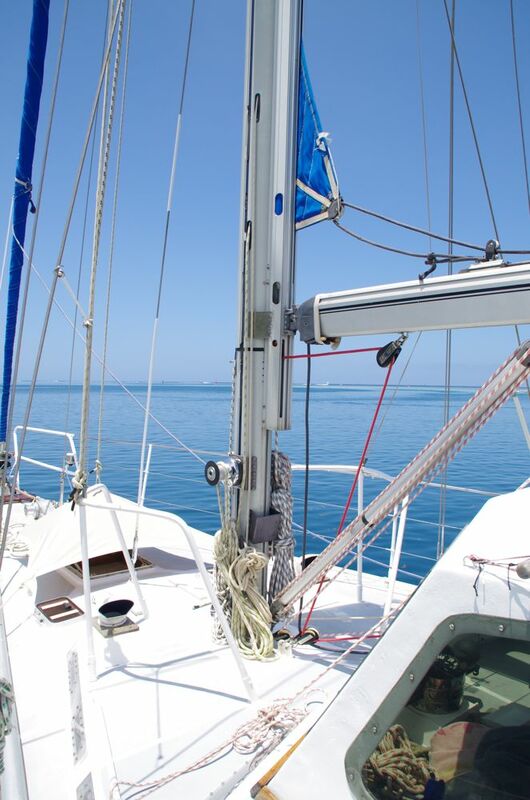 On both sides of the mast are 0,80m high stanchions to protect the sailor when working on the mast (which actually should not be necessary with the installed roller furler setup). Along all the superstructure are grab rails. 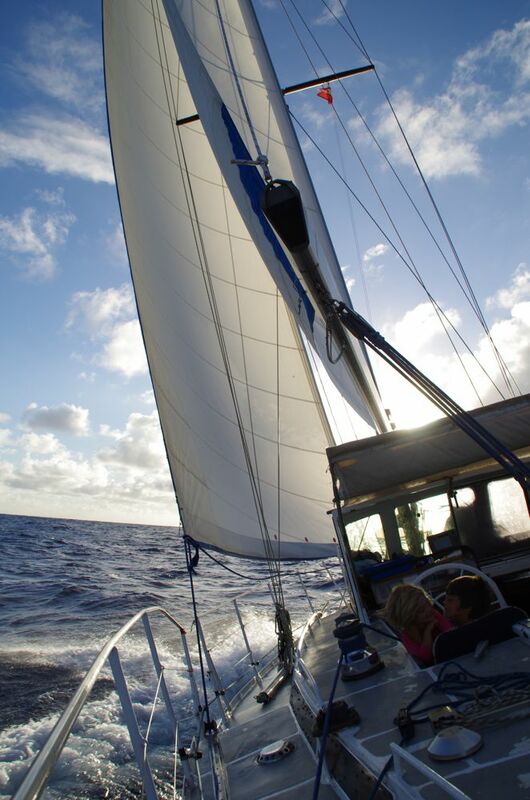 Everything mounted on deck is made from 316m stainless steel. 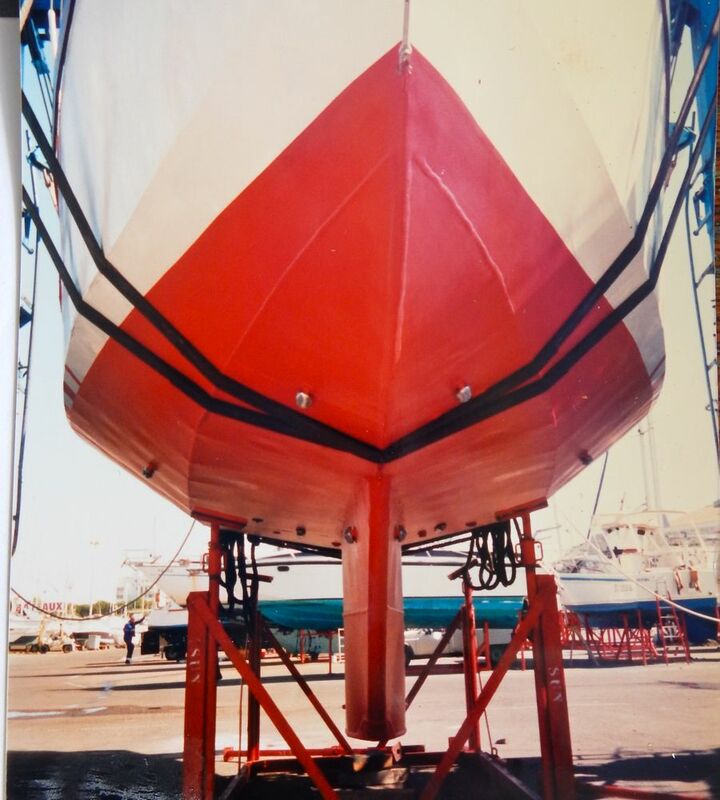 Two massive cleats are to be found front and aft, four are midships. 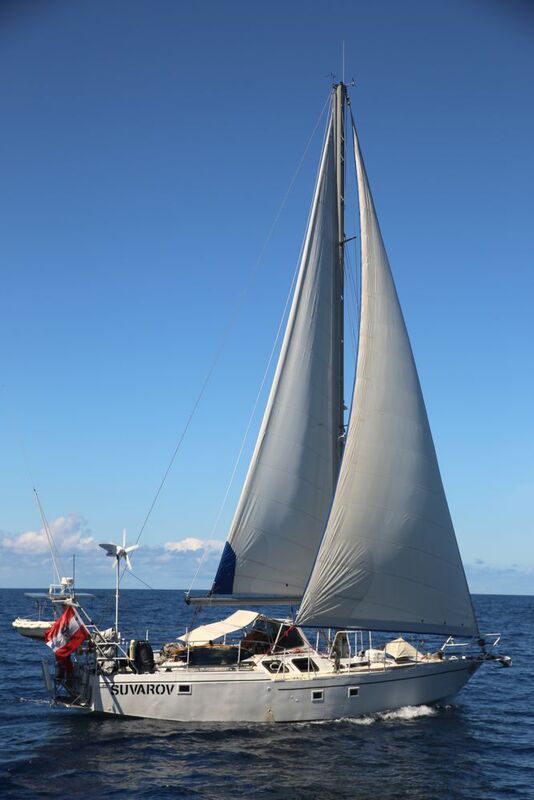 Bow: Small bowsprit with seat in front of the genoa (‘delphinarium’), located right behind is a small anchor locker which is used to store lines, anchor ball, anchor buddy, etc. 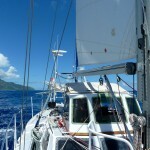 Aft of that, behind the windlass is the cutter stay, a large hatch and two smaller windows. 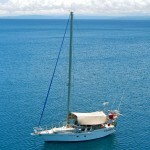 The 6-person rigid life raft is stored right in front of the mast. 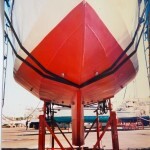 Midships:, 10mm baby stay, two lower, two mid and two higher shrouds and the running backstays are to be found here. 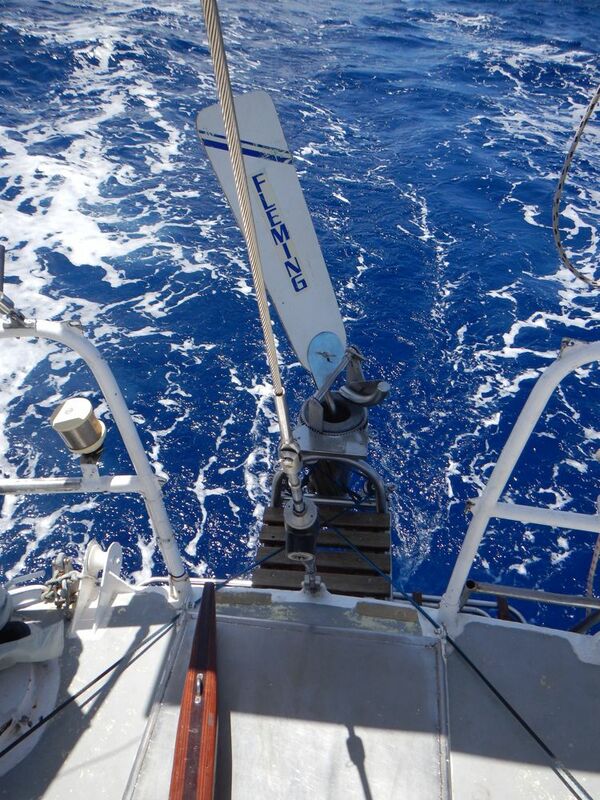 The guardrail can be opened on both sides using pelican hooks. Two solid cleats are mounted on both sides. 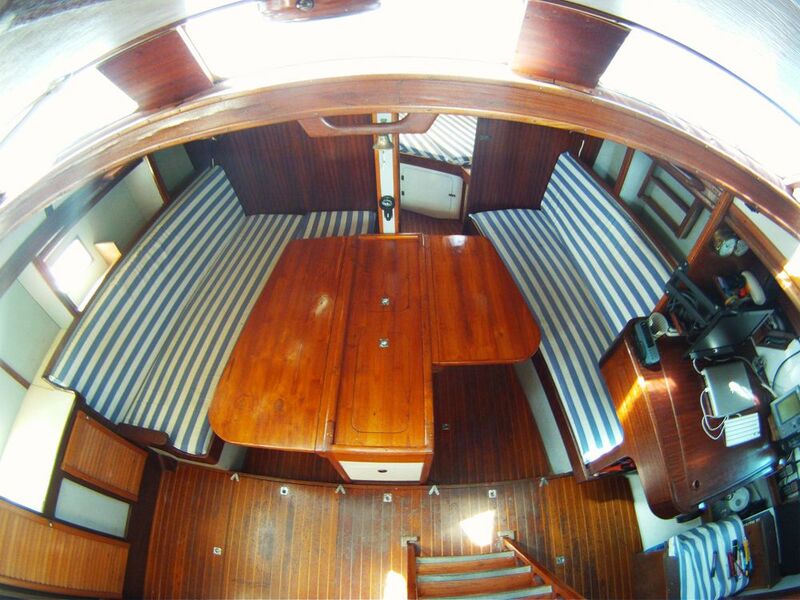 Two dorade vents direct fresh air into the saloon. Cockpit: Self bailing center cockpit, in front a big permanent doghouse with attached sun roof to be folded out towards the aft, covering the whole cockpit when out on sea. 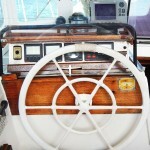 All navigation equipment is to be found directly at the helm: Suunto compass, echo sounder, log, wind instrument, autopilot, chart plotter, engine- and windlass controls and the cockpit light. 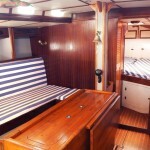 Two companionways into the aft cabin and the saloon can be closed using watertight hatches. 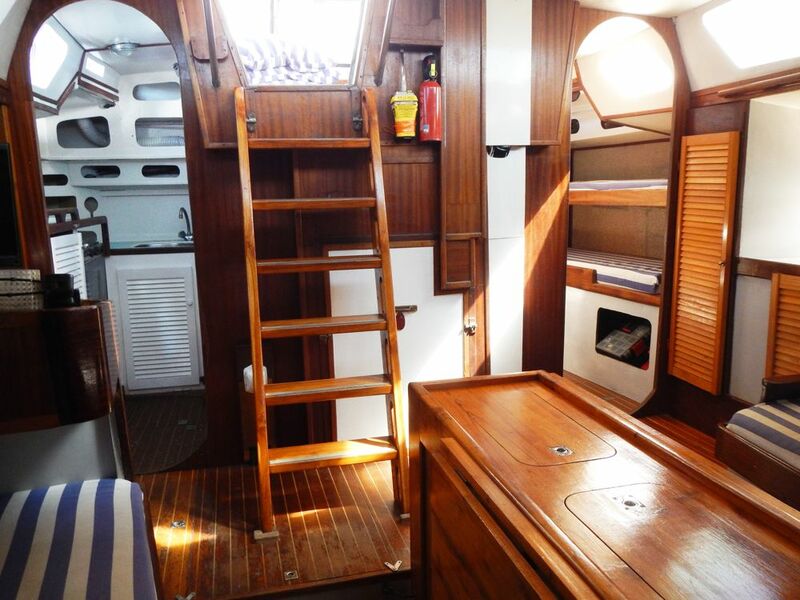 Aft deck: Very big aft deck with enough room to store a dinghy, bike, kayak, etc. 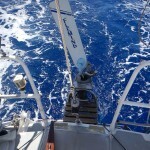 Big, removable tiller that is used for the wind steering. 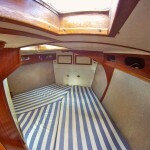 On the starboard side the deck shower. 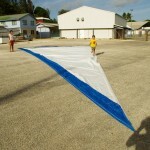 Lazarette: Width 2,20m, length 1m, depth 1.3m. Enormous storage for jerry cans, fenders, lines, spare anchors, drum with 50m anchor warp, spare rigging and wood parts, diving gear, etc. 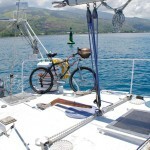 The extra compartment for the 13l gas bottle is on the starboard side. One more13l bottle and a 7l emergency bottle are in the lazarette. 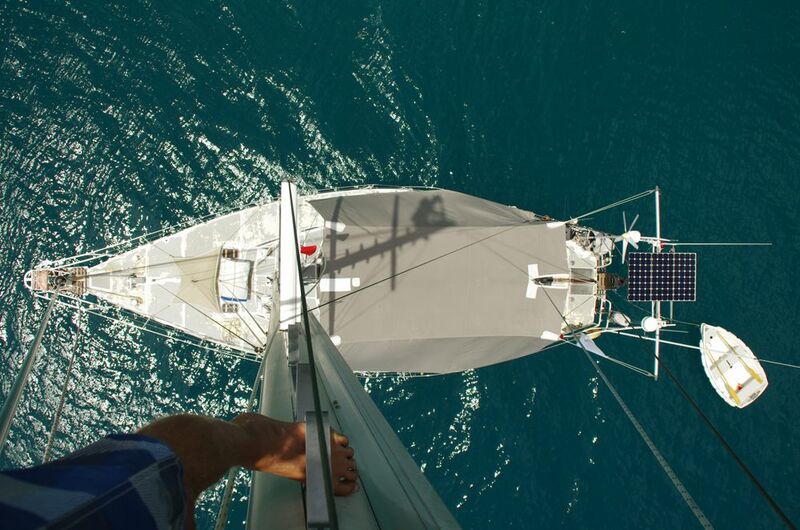 Mounted on the starboard side is the SG-230 antenna tuner for the shortwave radio. Bathing platform: Made from stainless steel/teak, permanently mounted with folding stainless steel ladder. 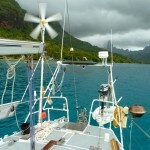 Rock solid ‘Fleming’ wind vane mounted to the stern. 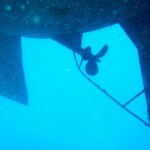 Underneath is a drum with 200m of floating line for the horseshoe buoy. 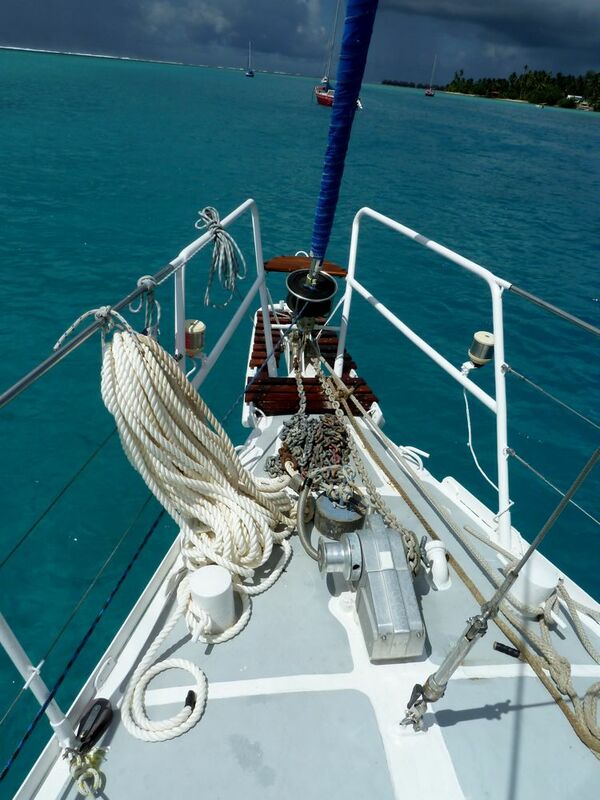 Standing on the starboard side: a 35kg anchor. 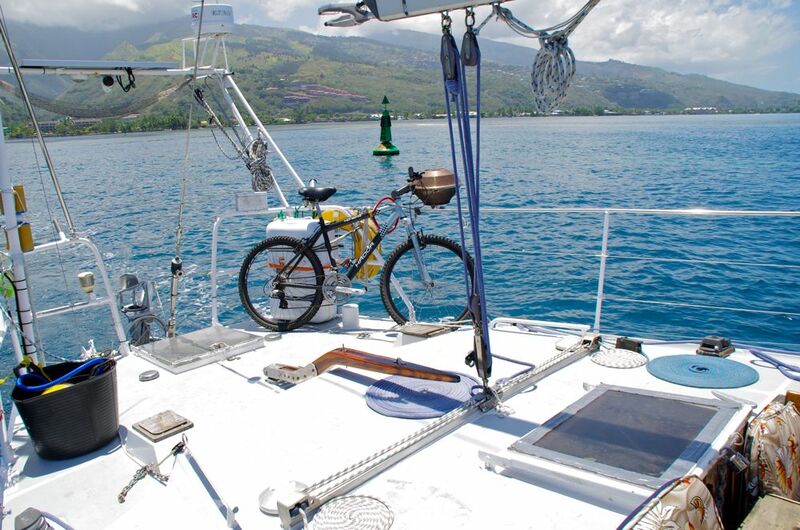 Davits/equipment rack: Mounted astern, on the equipment rack are installed: 3x100W solar panels, radar, radar detector, remote compass, WIFI antenna, VHF antenna and the automatic anchor light. 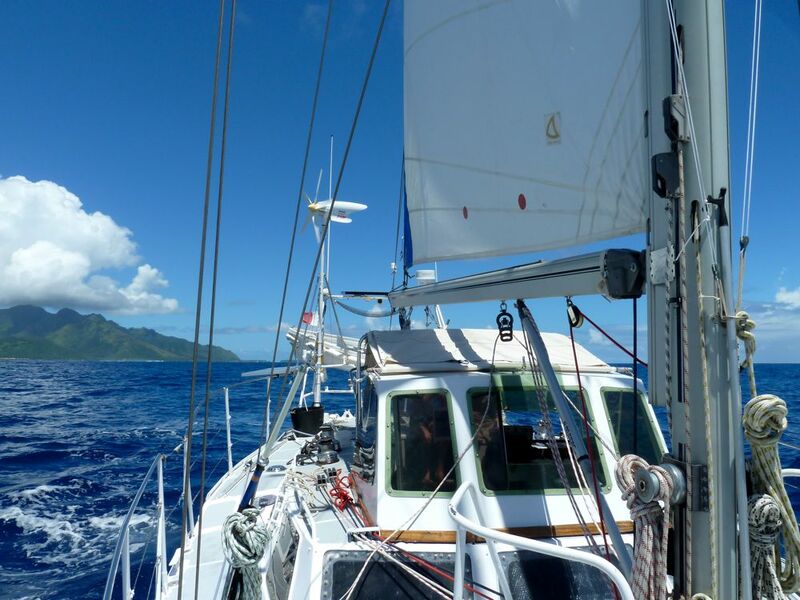 Mounted separately on the starboard side is the D400 wind generator, on the port side the 7,50m ‘Shakespeare’ shortwave antenna. 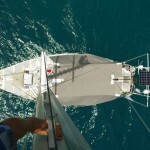 Mast: 16,50m high, stepped on deck, with two crosstrees and mast steps. 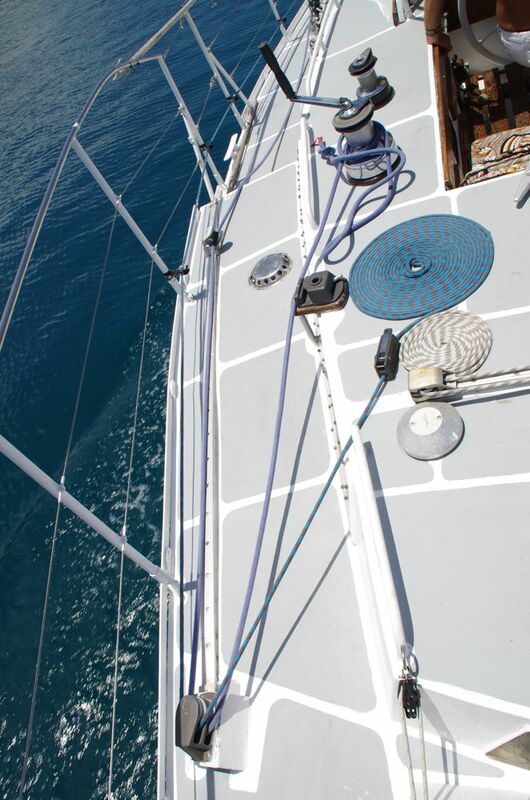 Three cleats mounted on starboard and port side, two rope jammers on port side (for genoa and main halyard). 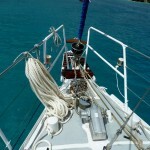 Two speed 30 winch on starboard, two speed 40 Harken winch on port side. 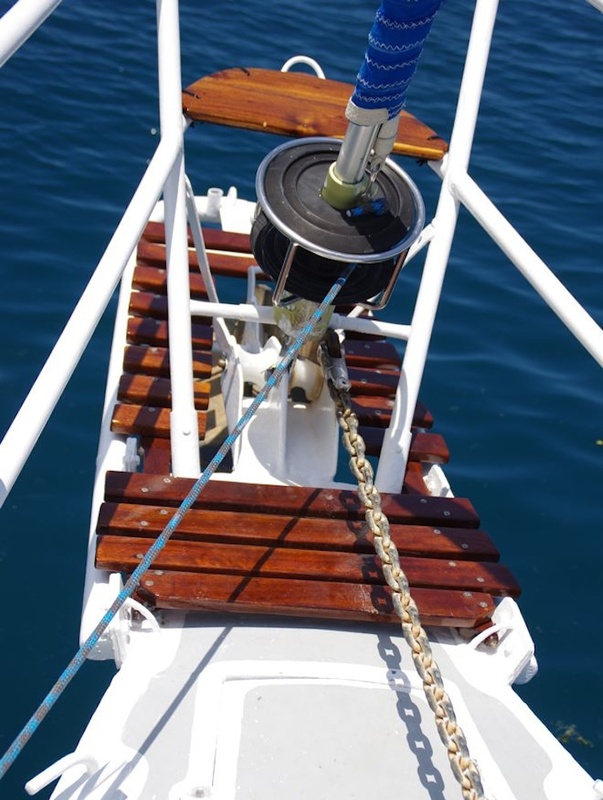 Mounting plate for additional third winch on the aft side. 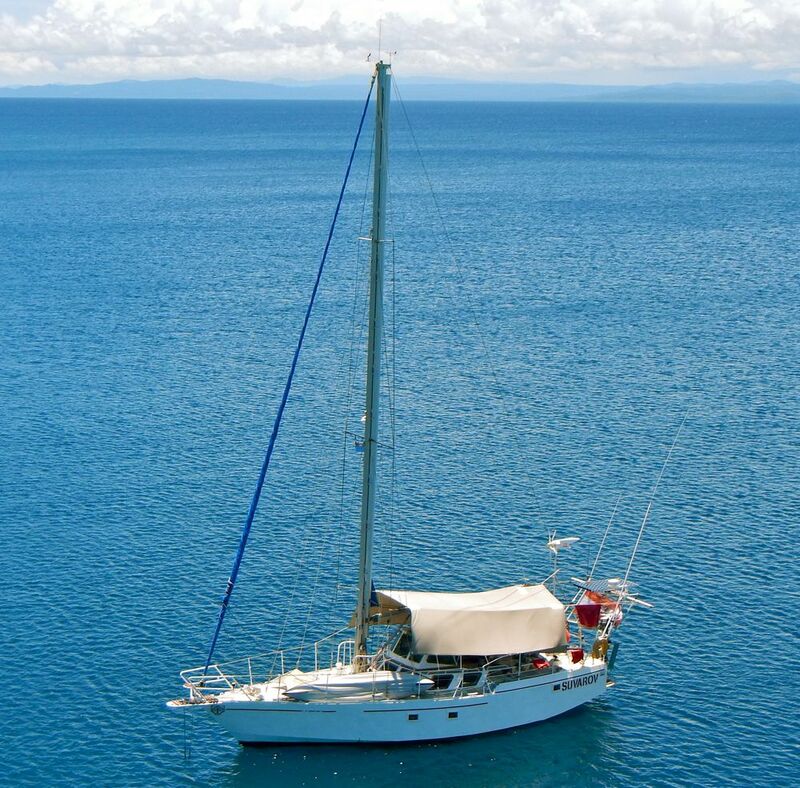 Boom: ‘Francespar’, length: 5,00m, equipped with sheaves and jammers for conventional main with three reefs. 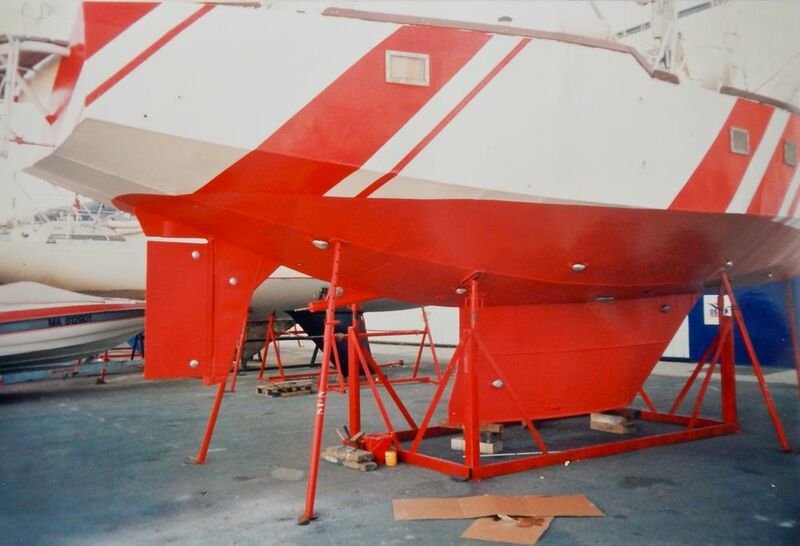 Francespar boom lift and boom break. 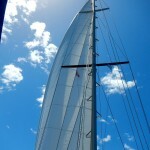 Genoa: 57m² mounted to ProFurl LC-42 roller furler, made by Vega-Sails (2011), sunbrella on foot and leech. Jib 1: approx. 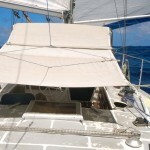 25m², staysail for cutter stay. 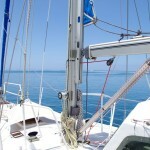 2x spinnaker halyard, 2x jib halyard, 1x genoa halyard, 1x main halyard. 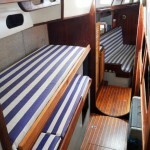 2x Lewmar 50 two speed, self tailing on starboard and port (for genoa). 1x Lewmar 43 two speed, self tailing on starboard side. 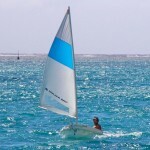 1x Harken Barbarossa 32.2, two speed, self tailing on port side. 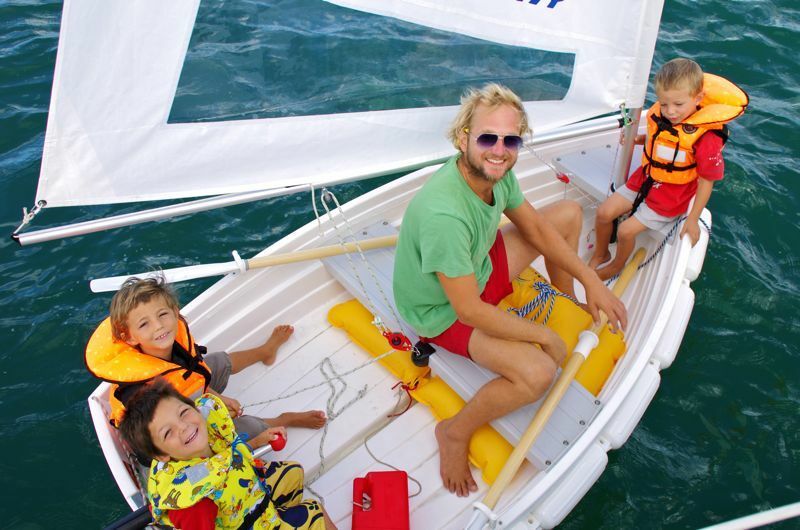 Additionally: Four jammers for main sail, vang and topping lift, two cleats and two Harken heavy duty jammers for genoa sheets. 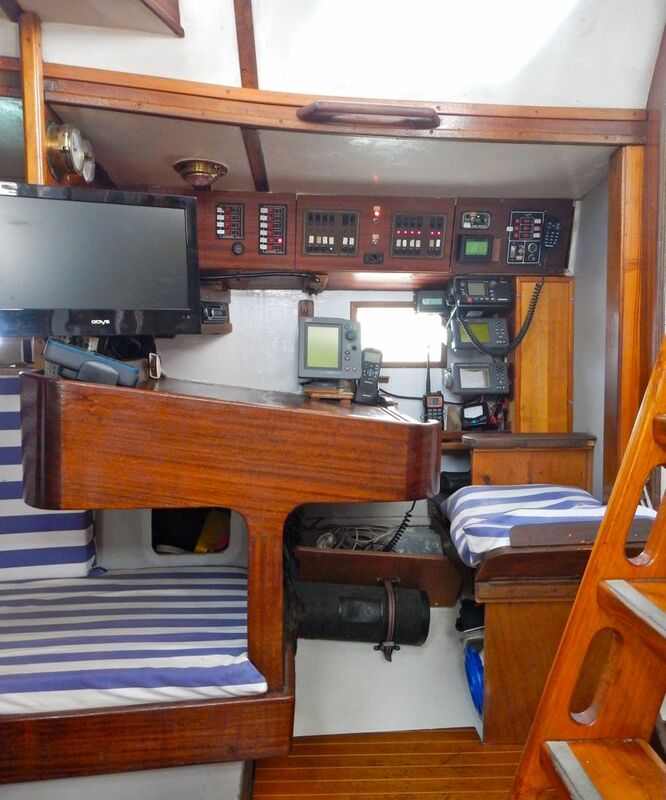 Traveller for main sheet is behind the aft companionway, genoa tracks on both sides of the cockpit. all stays were exchanged in 2010 by the previous owner. 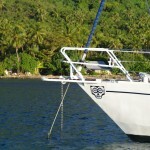 Anchor gear: At the bow is our favourite: the 100% reliable 20kg ‘Buegel’-anchor. Attached using a heavy duty stainless steel swivel to a 10mm chain, 75m long, all galvanised. The chain was bought in april 2011 and is in mint condition. 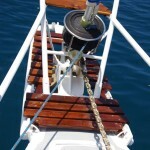 At the stern, ready to drop at on the bathing platform is a 35kg anchor with 20m, 8mm chain and 50m one-inch cable. 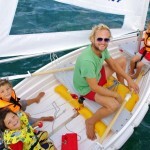 In the lazarett another 20kg Brittany anchor and 2kg as well as 5kg dinghy anchors. 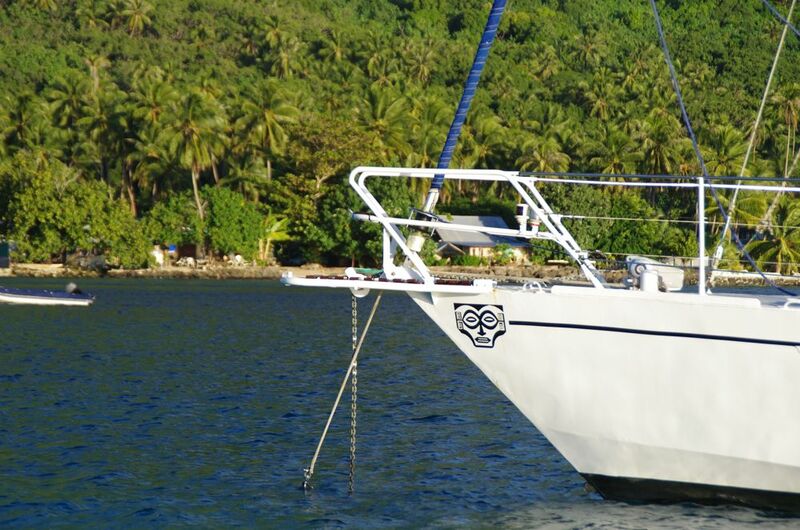 The powerful Lofrans Tigres, 1200W windlass will pull the ship against 25knots of wind and stow away the chain to the inside, in front and underneath the front double-berth. 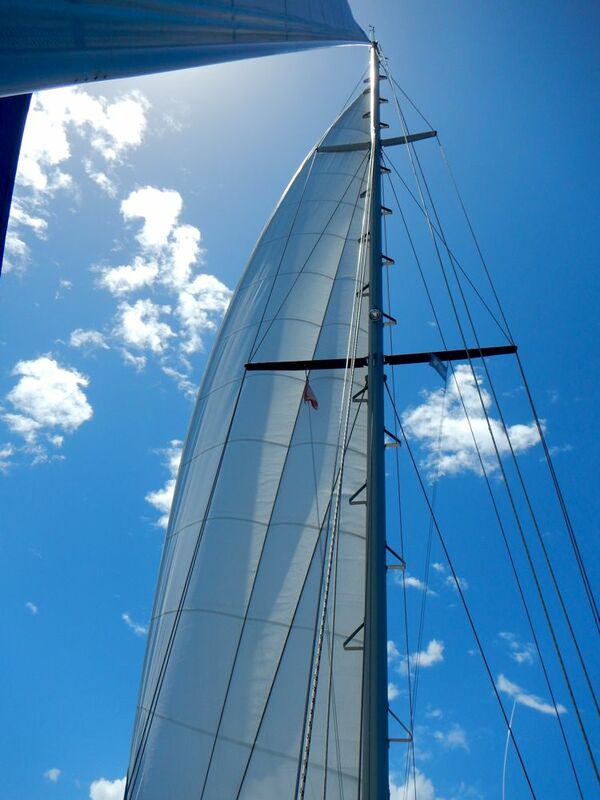 The windlass also has a pulley for manually lifting the chain as well as a drum for ropes. 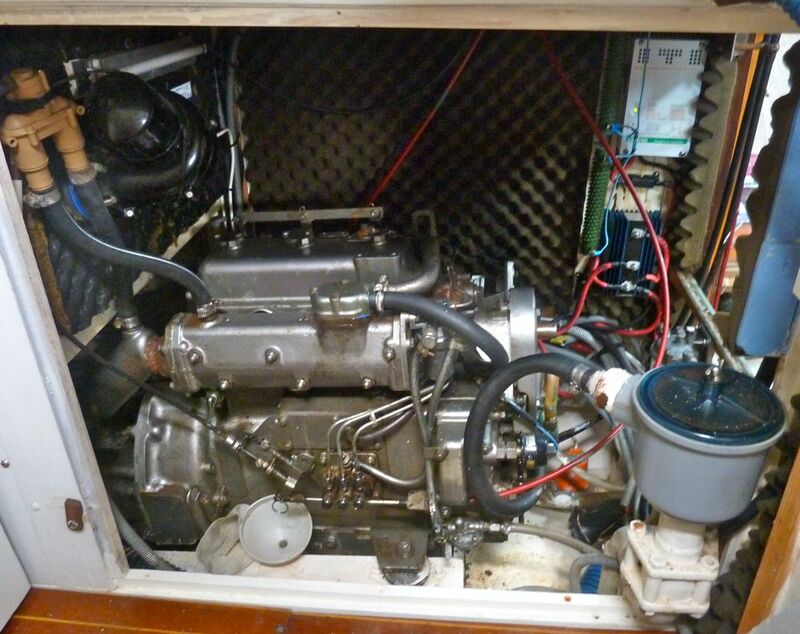 Engine: Yanmar 3QM30H 34hp (26kW) (2640 hours), fuel consumption: approx. 2,5 l/h at 1800rpm. Shaft seal: Volvo-Penta The engine can be easily accessed from three sides, the engine room has a light permanently installed. 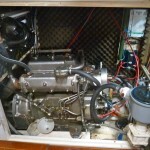 The engine starts easy, runs very smooth and uses no oil. 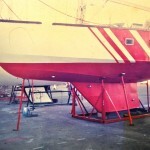 The two fuel tanks are to the front of the engine in the keel and hold about 60 liters each. 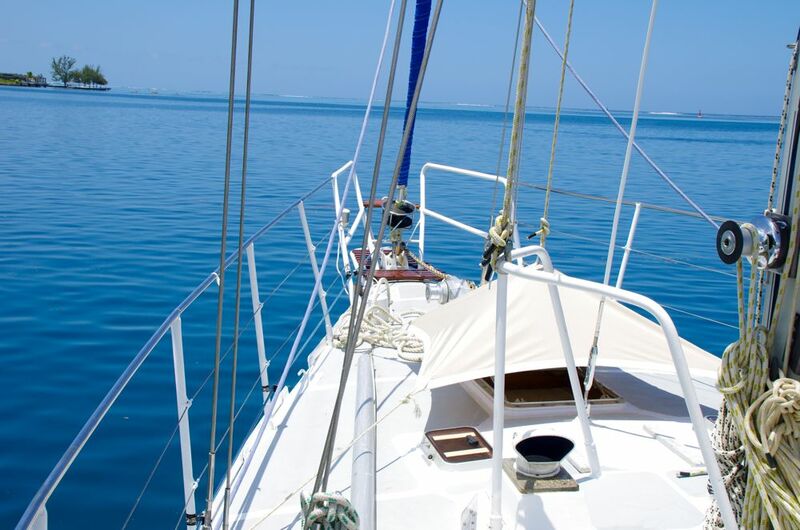 All fuel and oil filters are easily accessed and plenty of spare parts are on board. 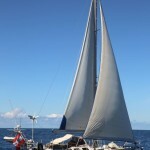 Although it seems, the engine is slightly to small it still pushes the boat along with 5,5 knots at 2000rpm and will still do three knots going against rough seas. In emergencies, the engine can be started using a hand crank ! Electrics: Four house batteries with 100Ah each (2011), one battery for the engine with 70Ah (february 2014). Three solar panels, 100W each, connected to a ‘Votronic MPP225 Duo’ solar charger. 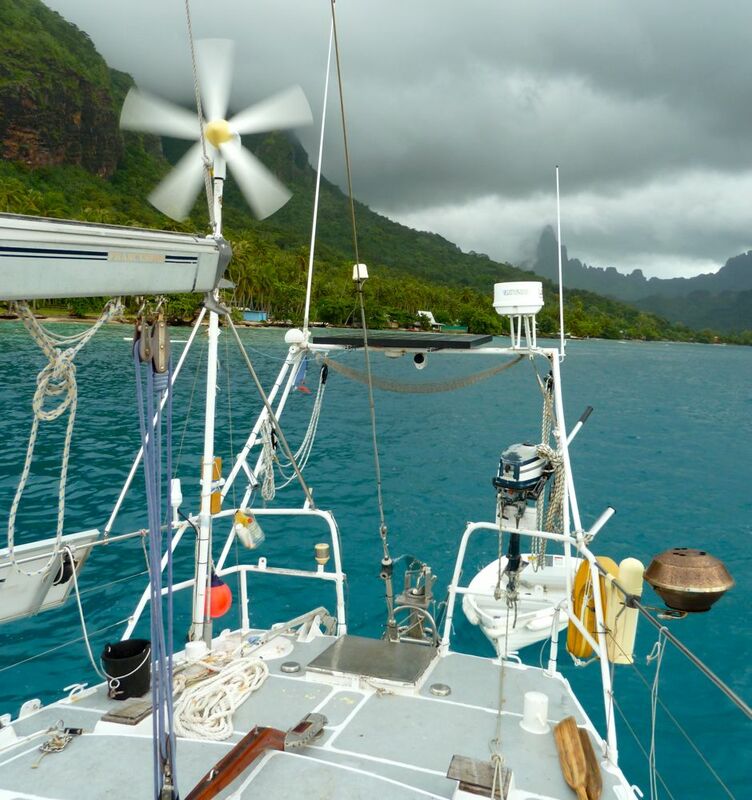 Completely silent and very efficient wind generator ‘D400′ with max. output of 400W. 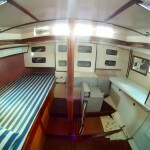 All interior lights are LED as are the navigation lights. 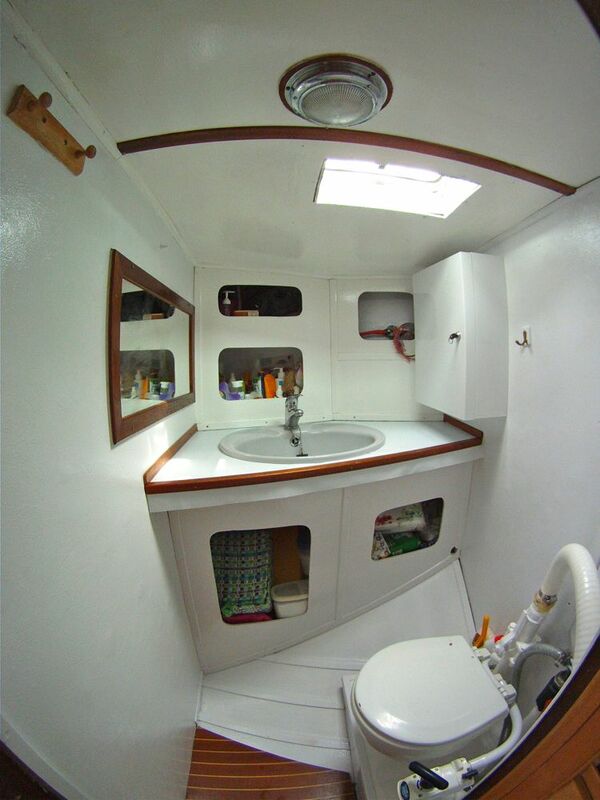 All cabins have 12V ‘cigarette lighter’ connectors and USB chargers. 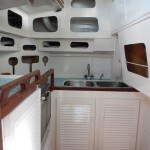 In the aft cabin, galley, in the passageway to the aft cabin and at the chart table there are 230V sockets, connected to the ‘Waeco SinePower MSP2012′ inverter with a maximum output of 4kW (!!). With this one can easily connect a vacuum cleaner or the electric welding gear using battery power. 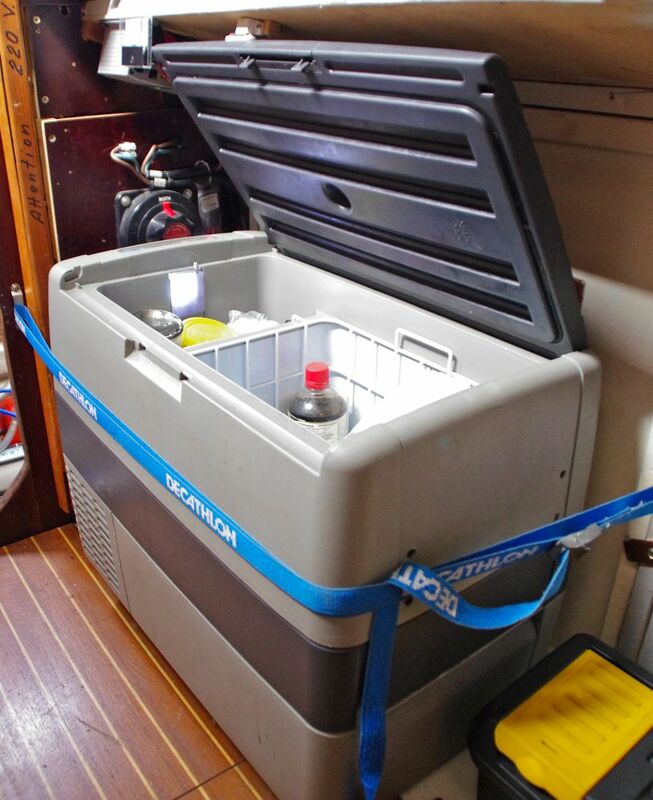 All batteries as well as the two diesel and the water tank are monitored and graphically displayed using the ‘BlueSea VSM422′ battery and tank monitor. 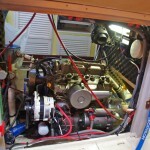 Also installed is a ‘Waeco Perfectcharge IU2512′ battery charger for shore power with 25A and a powerful alternator with 90A, connected to a MasterVolt AlphaPro controller for ideal charging. 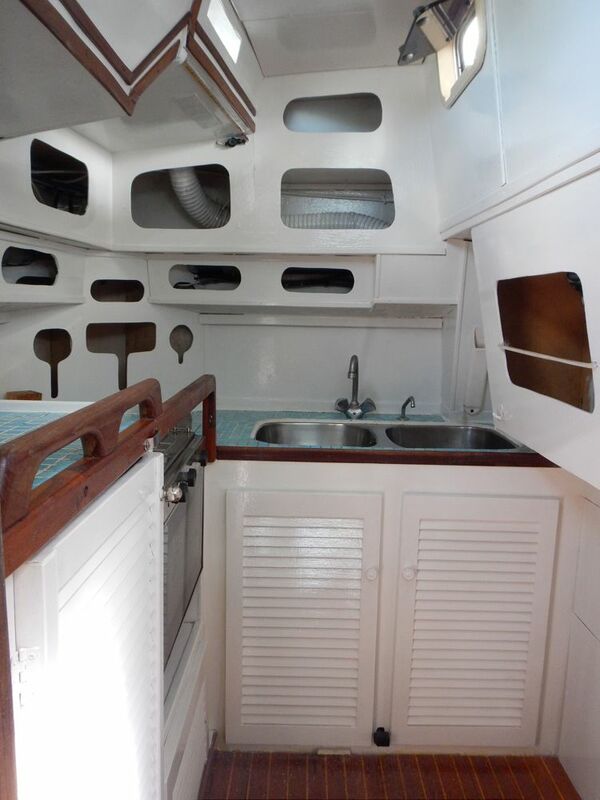 Comfort: Freshwater tank with 310 liters in the keel, access for maintenance underneath the saloon table. Jabsco water pressure system with water filter and 10l expansion tank for freshwater in bathroom, kitchen and for the deck shower. Watermaker ‘H2O factory ex21-12′ providing 25 liters per hour, using 20A can be run on solar power. 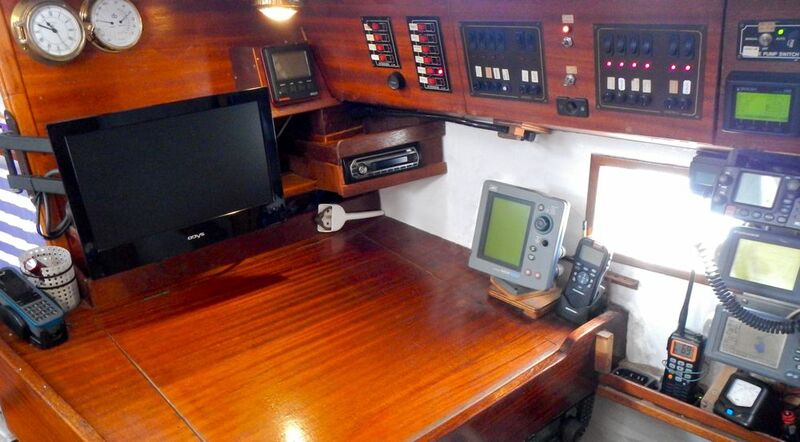 ◦ Raymarine A70D chartplotter for Navionics Gold. Including charts for Europe, Atlantic, Central- and Southamerica and the Pacific. ◦ Seatalk/NMEA bridge by Gadgetpool with USB and serial output to get ALL navigational data also on the laptop or board-PC. ◦ board-PC with Intel Atom D2550 processor, 2GB RAM, 60GB SSD harddisk and 360º swivel-mounted 16″ TFT monitor. ◦ Ship-internal WIFI router with externally connected ‘Bullet-M2′ WIFI router and +12DBi WIFI antenna for a maximum of 4km range ! 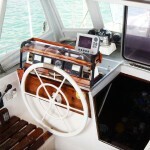 ◦ All interior and exterior lighting as well as all bilge pumps and navigational gear is controlled at the chart table. 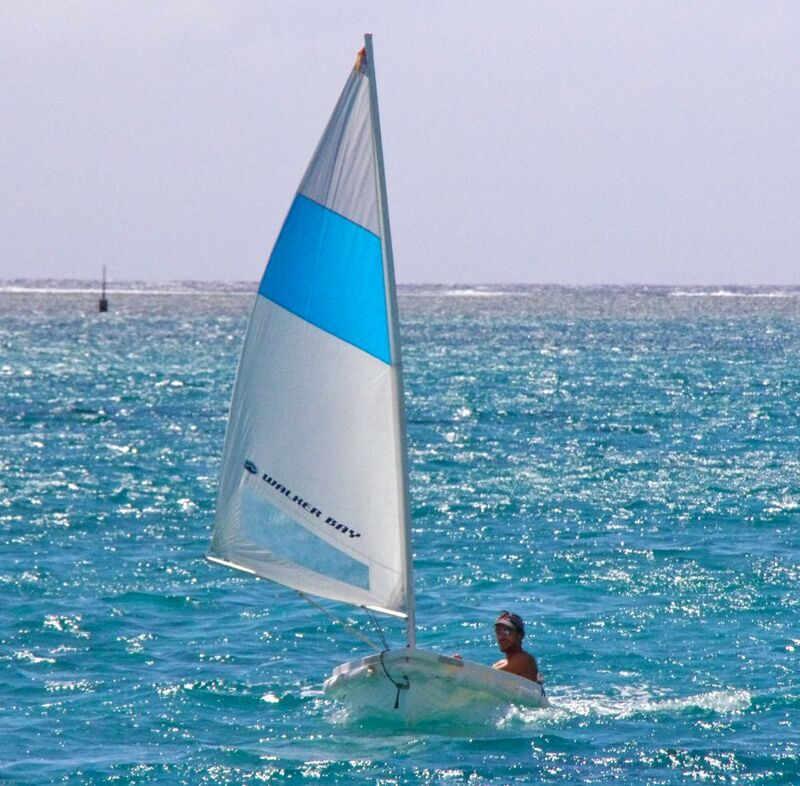 Dinghy: WalkerBay 8 foot rigid PVC-dinghy with complete sail set (mast, sail, rudder, daggerboard). 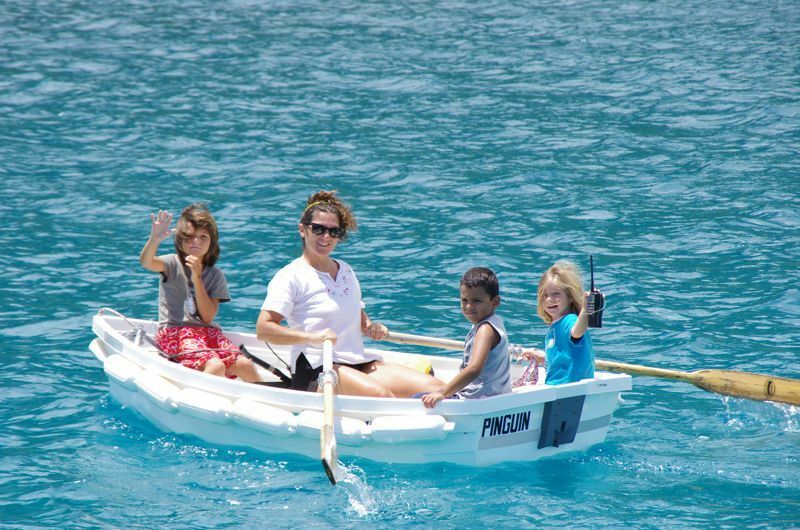 Unsinkable and nearly indestructible, very easy to move using oars but can also take a small (2hp) outboard. 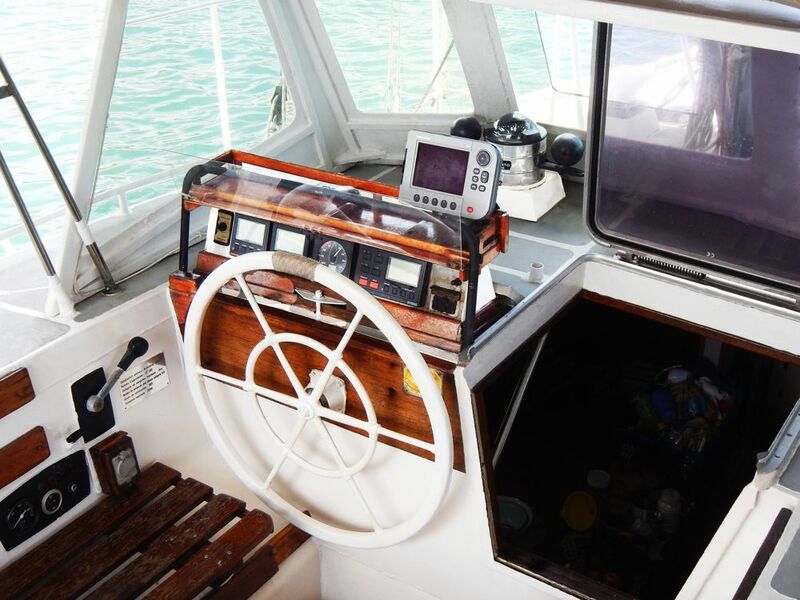 Safety gear: The ship is equipped with all gear mandatory for ocean going vessels: Epirb ‘Accusat MT403G’, Satphone, life raft, MOB buoy, first aid kit, horseshoe buoy with 200m line, flares, smoke pot, signal horn, fire extinguishers, sea anchor, rescue light, ocean-grade life jackets with sprayhood and rescue light and lots more. 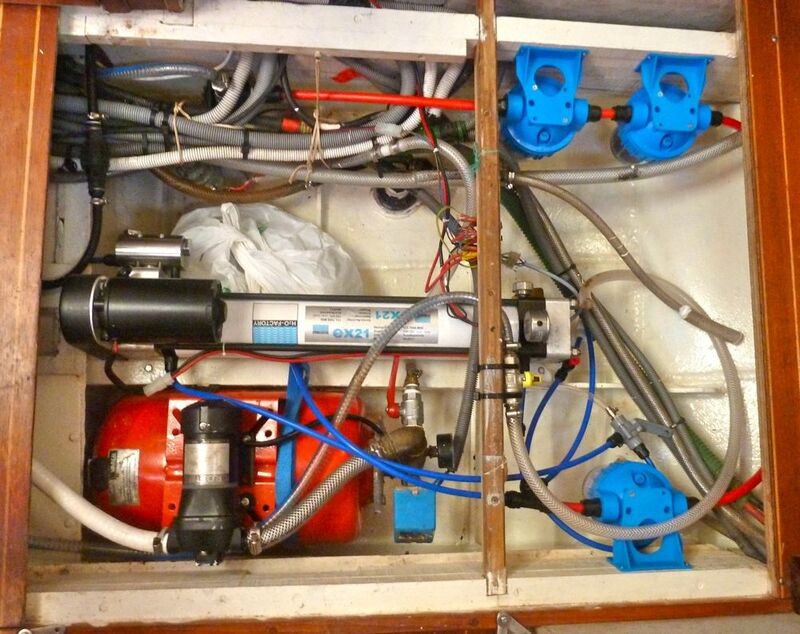 The boat has five bilge pumps one of which is movable. 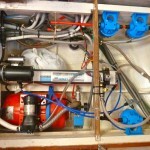 One manual bilge pump is installed accessible from the cockpit. A remote controlled alarm system is installed in the saloon. 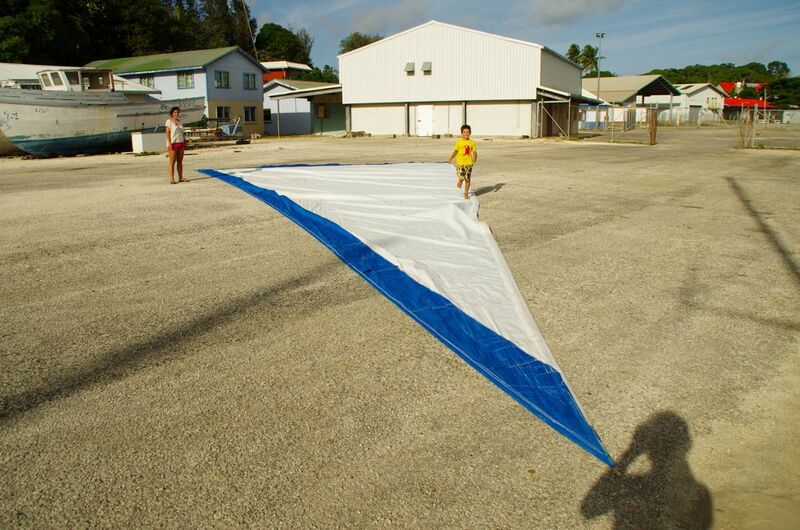 Additional gear: Two complete dive sets (bottle, neopren shortie, pressure gauge, bcd), inflatable kayak for two persons, two surfboards, one kite-/wakeboard. Gigantic sunroof that covers the whole ship aft of the mast, including permanently installed rain catcher, small sun roof for the hatch on the foredeck, sextant, binoculars, electric welding gear, power drill, dremel, angle grinder, grinder, tons of other tools, grinding and painting gear, crates full of rigging gear, shackles, pumps, plumbing gear, fishing gear, spare shrouds, spare wood, complete flag set, search light, pots and pans. 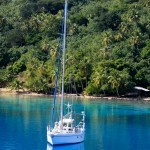 The ship was built in France in 1995 according to the plan ‘Sterven MK2′ of the architect Gilbert Caroff. Hull: 6mm steel, deck: 4mm steel. The finished works were verified by Mr. Caroff. 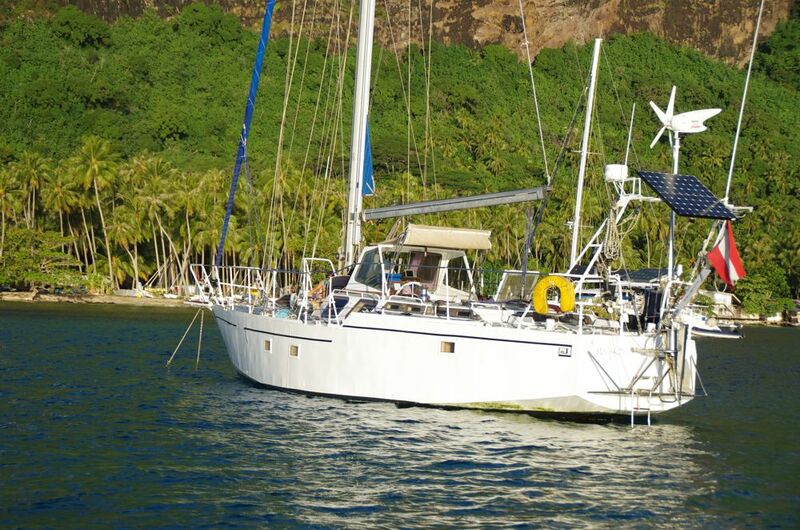 The first owner never sailed much and sold the boat in 2010. 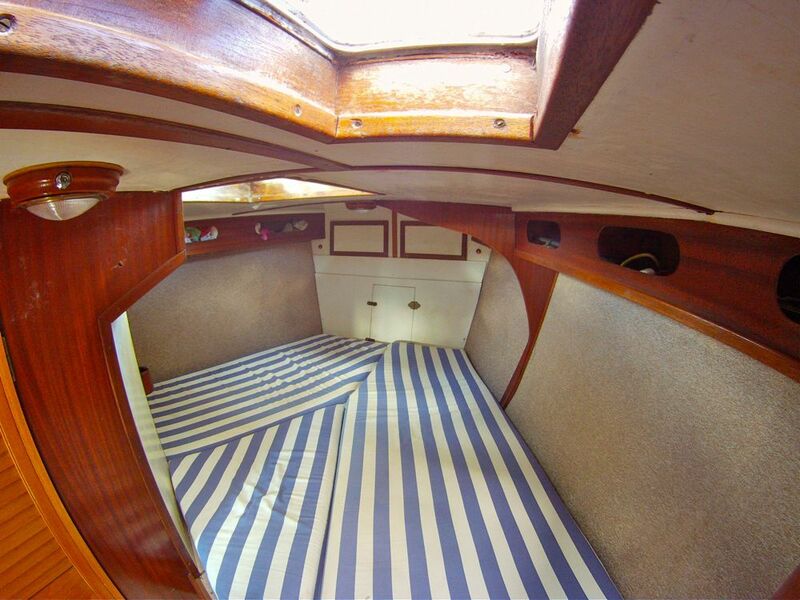 The new owner started to prepare her for bluewater cruising and made a major refit. In 2011 the ship was sailed out of the Mediterranean, crossed the Atlantic ocean and entered the Pacific via Panama channel in 2012. 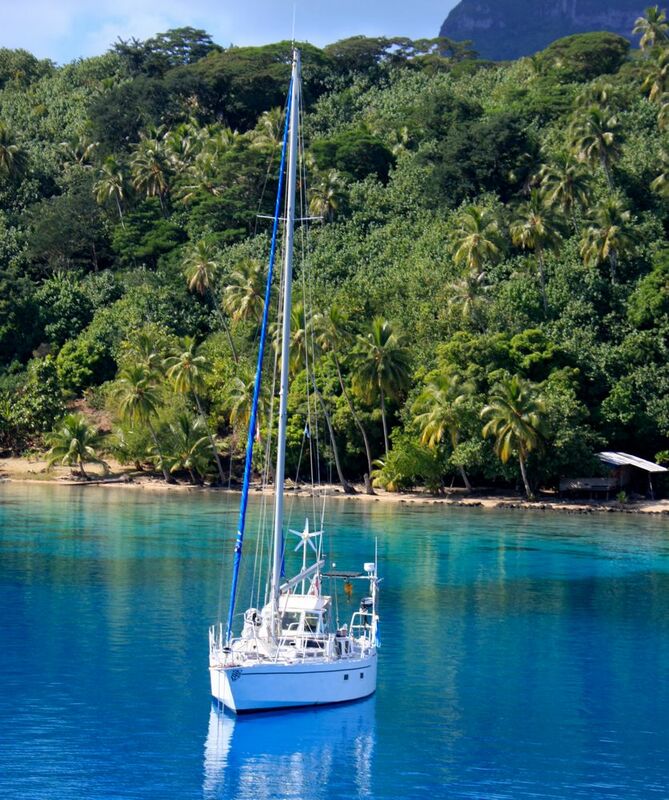 In mid 2012 the Suvarov reached french Polynesia where she was sold to the current owners who continued to sail her through the south Pacific to her current location. 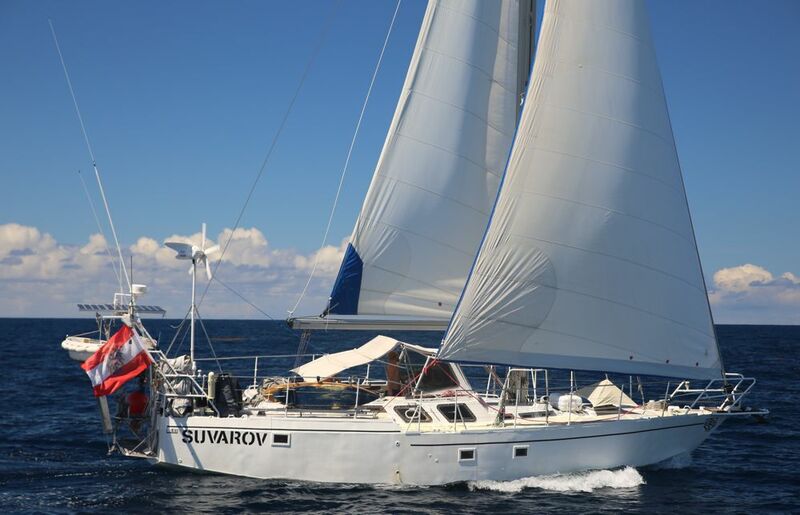 The Suvarov is currently registered in Austria as an ocean going vessel and insured worldwide by Pantaenius. 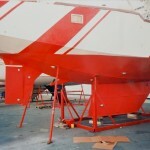 November 2010 : Adaptation of main sail to roller furler, hull sandblasted and freshly painted. 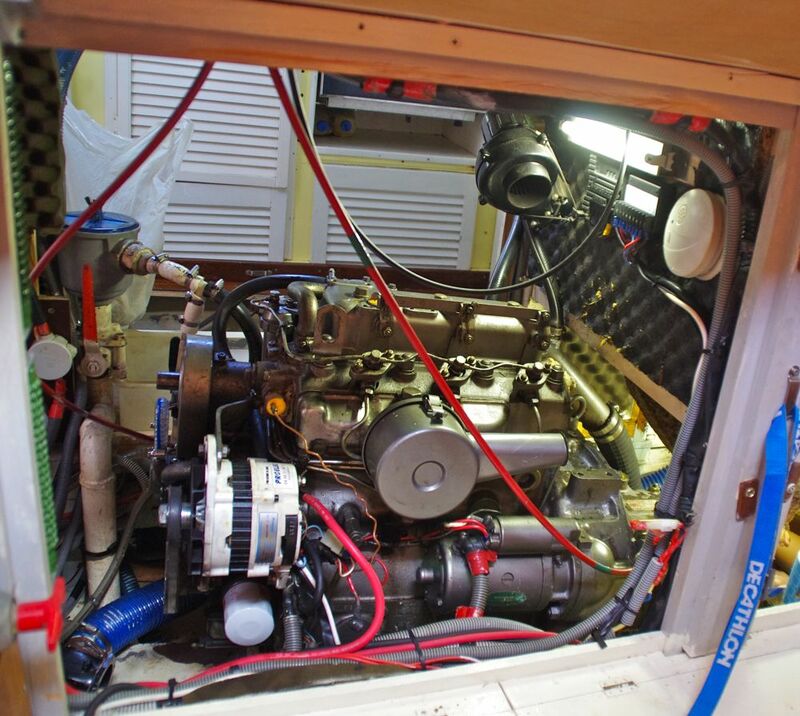 December 2013: Motor overhaul, maintenance of winches and new starter battery. 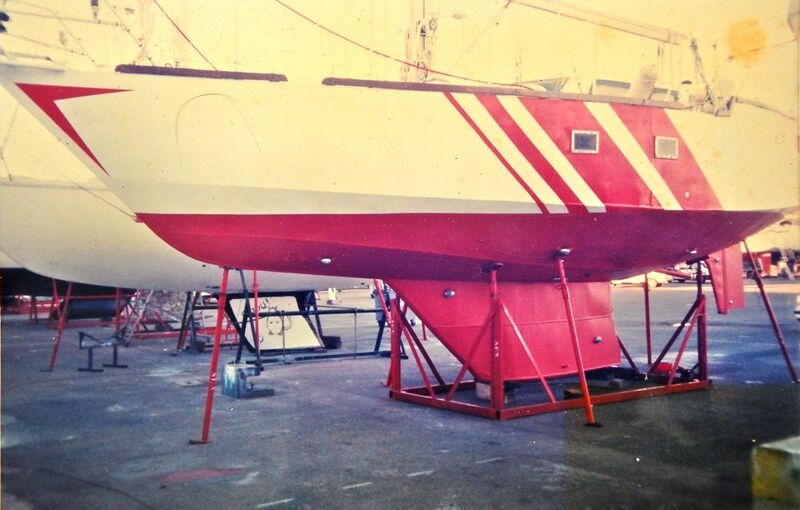 April 2014: New antifouling, new sacrificial anodes, new deck paint. 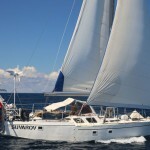 The Suvarov is a very safe and roomy ship that sails dry and upright. 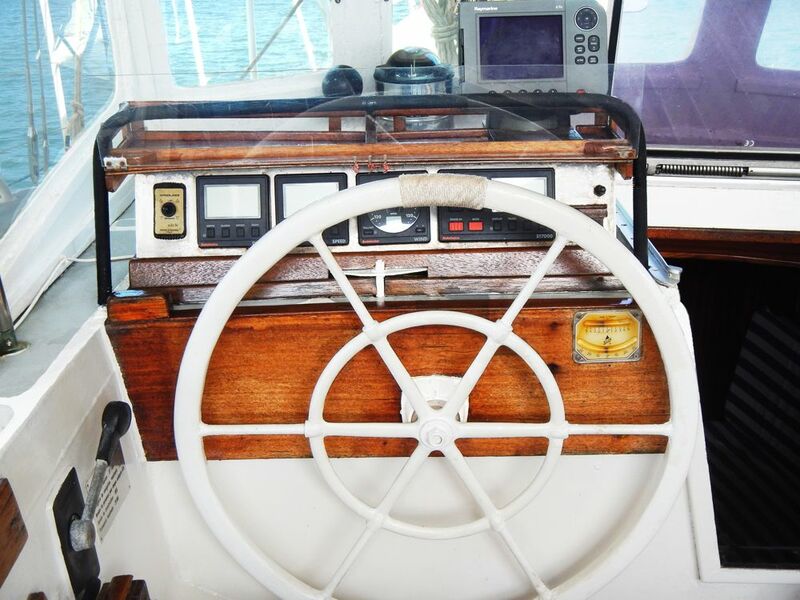 The center cockpit with the rigid dodger and the high guardrail gives additional safety. 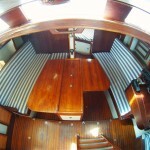 The boat was only really used during the last three years which explains the very good condition she is in. During those three years she was permanently inhabited and all maintenance work was done without delay. Today she is in better condition than ever before and can be put out on sea immediately. 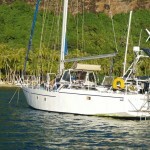 – And therefore she was sold and has a very happy new owner who has big plans for her. Ha! Da kann ich noch einen Kommentar hinterlassen. Weil im Blog geht’s nimmer?